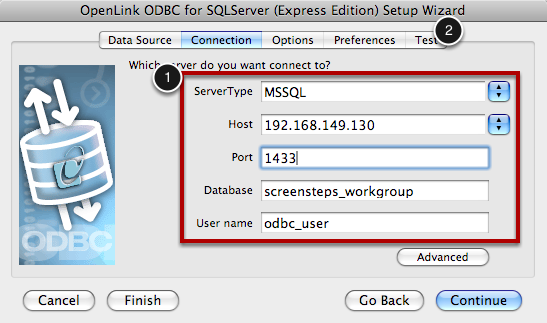 Connecting to SQL Server from an OS X computer requires a 3rd party ODBC driver. If you do not already have an ODBC driver that you use then we recommend you look at OpenLink ODBC drivers for Microsoft SQL Server. OpenLink sells commercial ODBC drivers that work in our tests. Demos are available so you can verify that the drivers work on your system. When connecting to your SQL Server database with the admin tool or ScreenSteps Desktop you will need to connect via a DSN. If you are not familiar with how to create a DSN then follow the instructions in this lesson. 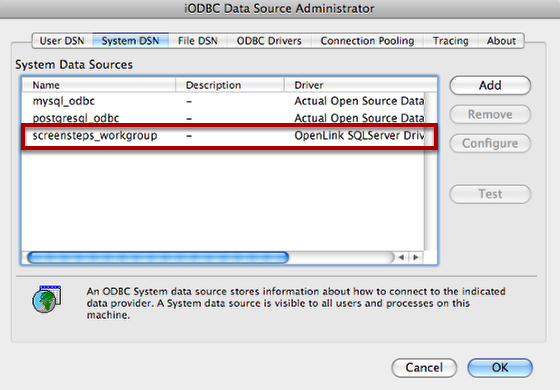 These instructions show how to create a new System DSN using the iODBC Data Source Administrator that comes with OpenLink's driver. 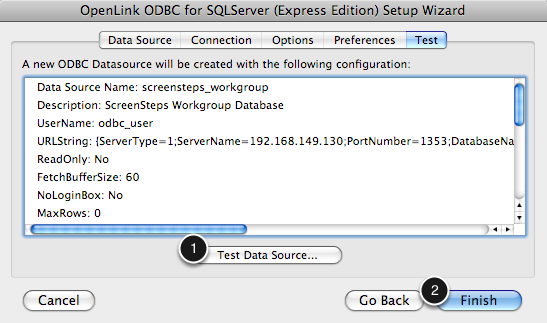 Note that any computer that tries to connect to ScreenSteps Workgroup will need to have the ODBC driver installed. 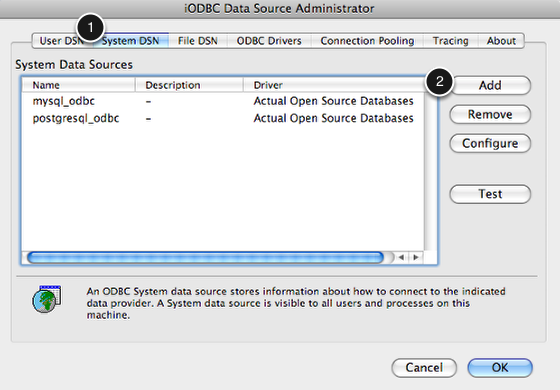 After launching the iODBC Data Source Administrator application switch to the System DSN tab and click the Add button. 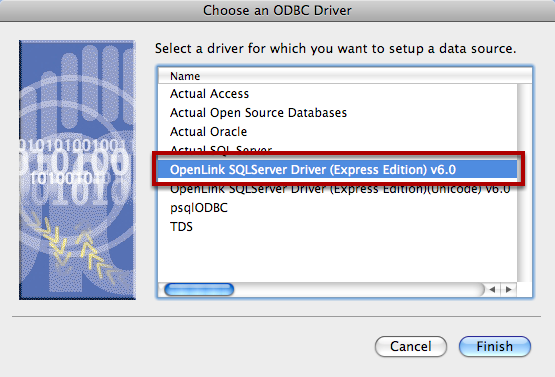 In the dialog that appears select the OpenLink SQLServer Driver v6.0 then click Finish. The next dialog that appears is the Setup Wizard. 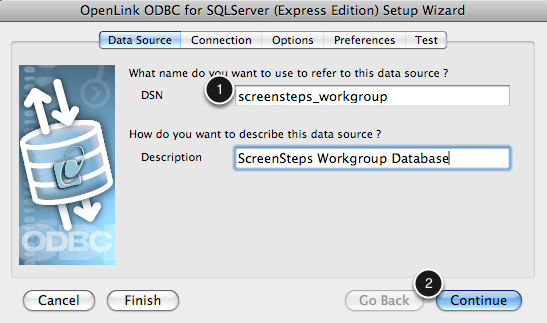 For the DSN name enter screensteps_workgroup (1). Click Continue (2). From the Connection pane enter the host where your SQL Server is located as well as the database name. For the user name use the user account you created in the previous lesson (1). After you finish configuring the settings switch to the Test tab (2). Click on the Test Data Source... button to verify that you have configured the connection properly (1). After you have successfully connected to the SQL Server database click the Finish button (2). You now have a System DSN that can be used to connect to the SQL Server database by any user on the computer. HINT: the iODBC Admin program is in the Applications/Utilities folder!